Take one abrasive professional athlete, a quirky out-of-work schoolteacher, and an overweight geriatric dog, and you're ready for a lesson in love . . . Tippy style. As Gina travels through Cal's world with Tippy in tow, she begins to see Cal in a different light. Gina longs to show Cal the God-given blessings in his life that have nothing to do with baseball or fame. When her longing blooms into attraction, Gina does her best to suppress it. But Cal is falling in love with her too . . . 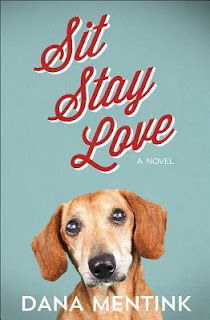 When I received Sit Stay Love in the mail, I scanned a photo of the cover and posted it to my Facebook page with the words: "I think I am the target audience for this book." The cover features a soulful, expressive dachshund face - a senior dog. The only thing I love more than dachshunds is senior dachshunds, and the dog on the cover bears a strong resemblance to my late dachshund Lucy Ricardo. I read this book over the weekend, and it is a perfect weekend read. Sit Stay Love is a light romantic story about Gina, a former school teacher turned dog sitter, and Cal, a baseball player who has just lost his mother and inherited her senior dachshund, Tippy. Despite the difference in these characters' lives, a friendship with romantic chemistry slowly develops. This all happens because of Tippy. Part of the story takes place in San Francisco, and part takes place on a charming rural ranch. Gina is a very likable protagonist who practices kindness every day and prays for people she cares about. Although Cal initially comes off as gruff, he becomes sympathetic as readers learn about his background growing up on a ranch with his mother, aunt, and uncle. Of course, dachshund lovers will delight in this book. The author really captures the doxie personality perfectly, and Tippy is a star in this story. I very highly recommend Sit Stay Love, especially as a beach read or weekend read. It is absolutely delightful, and you will fall in love with Tippy, as I did.